Chiefs coach Todd Haley is incredibly superstitious. He has the second largest rabbit foot collection in the NFL (behind Rex Ryan duh). He also scored the lowest in “Plays well with others” in each of his four years in kindergarten. Ol’ friend Miz is preparing Korean BBQ beef this week, or Bulgogi. Todd Haley also happens to be the Dear Leader’s favorite football coach. After Dear Leader himself that is, he did lead the People’s Korea team to 43 straight Super Bowl wins. You can also find presliced, already marinaded Bulgogi at Trader Joes. Todd Haley can’t go there though he thinks Hawaiian shirts are unlucky. Silly Todd it’s the tiki idols that have bad juju. Within the past few months Boulevard Brewing out of Kansas City has started to distribute to New England. As you can see on their site they make over a dozen different beers. However they’re only shipping their Smokestack series here. It’s becoming a common theme, where a brewery will enter new markets only with their bigger more limited beers. I guess the idea is the market already has enough IPAs, Stouts and Wheat beers, but the big versions travel well, can stand sitting on shelves a little longer if necessary. Boulevard is sending five on a year round basis. These can be found in either 4 packs of 12 ounce bottles for $11-$12. Or 750ml bottles for about $10. The 4 packs are the better value. Double Wide IPA, a double IPA 8.5% ABV and pretty full in body for a double IPA. This one pushes the line between Double IPA and a light American Barleywine. Hoppy in a floral way, with a lot of caramel flavor. Long Strange Triple, only available in the 750 ml bottles. 9% ABV and holds it’s own against imported Tripels. Highly carbonated. Sixth Glass, a 10.5% Belgian style Quadruple. Quads are sort of a hybrid between a Triple and a Belgian Strong Dark, but bigger than most Strong Darks and all Tripels. Like most this one is made with Belgian Candi Syrup which gives distinct plummy dark fruit flavors. Highly carbonated. Tank 7 Farmhouse Ale a strong Saison at 8%. This one could just as easily be considered a Belgian IPA. The hops are strong enough in flavor if not bitterness. Probably the most drinkable of all the Boulevard beers shipped to New England. This is the one I’d drink more than one of in a sitting. Dark Truth Stout a 9.7% Imperial Stout. A big, dark beer full of coffee and chocolate flavors. Uses rye, wheat and oats in addition to barley. Not as hoppy as some Imperial Stouts. They’re also sending seasonals. I’ve seen two so far, and only in the 750ml bottles. Nommo Double, 8% ABV Dubbel. Contrasted to the Long Strange Triple, Nommo is slightly lower in alcohol, but has a fuller body and spicier taste. It also has some dark fruit flavors but not as much as in the Sixth Glass. It is the Fall seasonal, but you’ll probably see it in stores after most of the Octoberfests and Bartles & James Pumpkin Coolers are gone. Harvest Dance Wheat Wine, in simple terms a Barleywine made with wheat. This Winter seasonal comes in at 9.1% ABV. The oak contributes vanilla and even a touch of coconut. Wheat can have a tart flavor, I think as of a result of it seeming less sweet than a barley beer. Highly carbonated. Smuttynose brewed the first beer of this style and were the ones to get the Federal regulations changed to allow the “Wheat Wine” name. Others have followed. Technically I believe the name is “Wheat Wine style Ale”, so people can’t be “mislead” into thinking it’s Wine instead of Beer. Yayyy regulation. Another good way to try a few is through the gift pack. 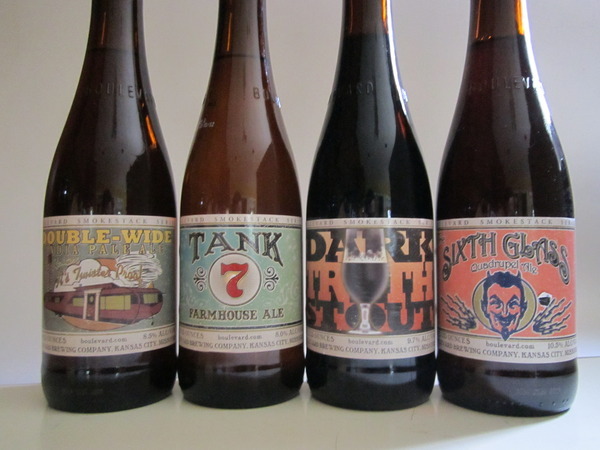 4 12 ounce bottles one each of Double Wide IPA, Dark Truth , Sixth Glass and Tank 7 Farmhouse Ale as well as a glass. Sells for about $18. These stronger beers aren’t for everyone, so it’s nice to have a way to buy singles. Great thing to buy for presents too, but more on that later.